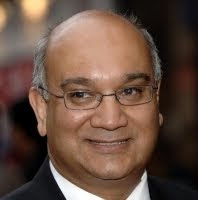 Keith Vaz’s sister Valerie has won the Labour candidacy for Walsall South. Local Labour members raised doubts that a truly “democratic process” had been followed, little good it did them. Unfortunately, my friends, we must face up to the fact that we may well have twice the amount of Vaz action going on in the Commons chamber. That’s twice the amount of toadying, twice the amount of slurping noises, twice the amount of Vaz-oline and twice the amount of (fill this space dear readers). That space isn't big enough for all the stuff I want to put in there. It is of course too much to hope that local labour members will draw the obvious conclusion and act accordingly. Holy f**king f**k! This just shows how nepotistic the Labour 'in crowd' are. How funny it would be if the Vaz and the Vazess where both rejected by the electorate. Your Fat Councillor would pay his weight champagne to see that. I'm afraid only the Eye's 'Alice pass the sick bag' will do.